If you’d like to get off the diet roller coaster or you’re tired of long boring cardio routines that barely seem to work, and if you’d like to create sustainable results faster and easier than you ever thought possible, then this might be the most important message you’ll read. It’s not just about the food! Ultimately the healthy, fit, lean, strong body you want to live in starts in your Mind. And this course will empower you to take charge of the thoughts and beliefs that are unconsciously guiding your every action and behavior, then weight-loss and fitness become not only possible but inevitable… and all without counting calories or being hungry all the time or depriving you of great-tasting food. Reason 1: As a 15 year practitioner of Hypnosis and NLP I discovered early on that most, if not all, of my weight loss clients were using food to soothe their anxiety and to validate their deep unconscious negative and limiting beliefs about themselves. When we addressed the actual cause of their over eating, and gave them tools to manage stress and loneliness and to soothe themselves in healthy ways, food stopped being a compulsion. Reason 2: We have all been deluged by the media in the last 30 years with false notions of which foods are healthy and which foods make us fat. For example: We were advised to eliminate saturated fat from our diets under the erroneous assumption that fat makes you fat. Wrong! It doesn’t. What’s more, we’ve been told that whole grains were just about the best thing we could eat. Wrong! A very simple, practical shift in the kinds of foods you eat not only increases your enjoyment of eating, it begins immediately to train your body to burn fat. AND you will feel full and satisfied. 12 Powerful hypnosis sessions to “install” smart goals, develop your “mind mastery” and reinforce your new choices. Learn at least 2 proven, leading-edge ways to get maximum results SAFELY from the minimum investment of exercise time and effort. Discover how the “Time Line Process” has the power to quite literally “program” your future. Understand how your unconscious mind is “hard-wired” to respond to “why” questions, and how this fact influences your weight loss goals. Simple-to-use yet powerful techniques to change your beliefs systems. A Different Approach From All The “Mainstream” Calorie Counting BS. If you keep doing what you’ve always been doing you will keep getting what you’ve always gotten. This course is fundamentally different from any other program out there. You can severely restrict calories only so long until it triggers hormones that actually cause you to retain fat. The solution is simple and sustainable, but it must be accompanied by a trained Mind which thinks in different ways than the ways that caused the problem in the first place. Does your instructor actually know how to help you? Have they overcome similar challenges successfully? I have just recently completed my own 12 month personal goal period where I lost 20 pounds and 6 plus inches easily and effortlessly (dropped 2 pants sizes as well) without going to a gym once. I have also healed myself of low energy, headaches, intestinal dysfunction and other significant physical ailments, as well as habitual negative thought patterns and habits around food and self-worth. And what’s more important, this has been SUSTAINABLE. Does the program have positive benefits in all areas of your life? Everyone comments about how the principles in this course help in EVERY area of people’s lives. Does the program have long-term positive effects that are self-perpetuating? The beauty of this program is that you can simply repeat it from the beginning every 30-60 days as you desire. The more you repeat it, the deeper your unconscious mind “gets” the transformational material and begins to guide your unconscious behaviors around food. Does the program utilize leading edge tools and techniques backed by solid science that enable you to stop wasting your time guided by erroneous “media myths” and actually get real, tangible, repeatable results? This one is packed with the latest research and concepts that actually work. We de-mythologize and cut through the fluff and misinformation that may be sabotaging your success. Does the program offer the kind of deep support that will assist you in getting through the challenging days when stress and “life” test your new way of thinking and behaving? Does the program come with continual updates? Refinements? Reinforcement? It is now a year after I began the course and I’m STILL adding valuable content to the member’s area. This Revolutionary Program is Specifically Designed to Ensure Your Rapid and Long-Term Success. And it’s different than any other program you have ever experienced or heard of before. This online course contains daily 3-part lessons covering “Mind, Movement and Menu” conveniently available to you 24/7 online. You can also move at your own pace and spread the modules out over several days if you want. Stream the videos and audios anywhere, at any time, on any device. As long as you have an internet connection you have access to the course modules. What’s more, you can even download the audio mp3’s and worksheets so you can have them on any device you own. I’ve passed my goal weight for this week! LIFETIME ACCESS to 16+ Power Packed Modules Videos and Audio downloads covering "Mind, Menu and Movement"
Over 7+ hours of video and audio tools, tips and techniques designed to help you reach your weight loss goals. PLUS your own personal self hypnosis session that you can listen to over and over again to totally retrain your unconscious mind to be confident and outgoing. Since I want to help as many people as possible I created this program as the best way to "get the word out" and share with you the EXACT SAME TOOLS AND TECHNIQUES I use with clients AS IF you are working with me directly, all from the privacy and comfort of your own home. "Your satisfaction is assured through my no risk, you-can’t-lose, 100%, no-questions-asked, iron-clad money-back guarantee. If for any reason you aren’t thrilled and satisfied with this program, just contact me within three (3) months and I’ll refund 100% of your purchase price. No hard feelings." "What I’m saying is, don’t decide now if Clear the Fear Fast is for you. Just get it and try it out. If it doesn’t do everything I say and more, if you don’t find yourself to be more confident and outgoing, if it isn’t life-changing, if it doesn’t work for you, you have nothing to worry about because you can get every dime of your money back under our no-loopholes guarantee. So you have nothing to lose and everything to gain." Remember, you get LIFETIME access to this program and can literally take it with you ANYWHERE, at ANY TIME... provided you have internet access! P.S. Remember, if you didn't need some help with this you wouldn't have read this far. Take action. Go for it! Don't delay. Act now while it's fresh on your mind. 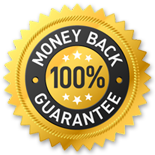 If it's not perfect for you, remember there is a complete and total money back guarantee. I'll take the risk but you have to take the first step. P.P.S. Many of the concepts in this course have been extensively researched and tested by a man you will never hear about or learn from except here, my 88-year-old father who still swims 3x a week, has a muscular body and flat tummy in spite of the fact that as a young man he lost his left leg, smoked, drank and ate a horrible diet. I will be interviewing him on your behalf and sharing his ideas as well. P.P.P.S. If you suffer from type 2 diabetes this program could very well save your feet, your eyesight and even your life. P.P.P.P.S. What if this course not only enables you to transform your body but it also teaches you key tools and concepts for achieving massive success in every other area of your life? Would it be worth it then?